The final dinner of the British Crystallographic Association Spring Meeting in Warwick was interrupted, as always, with the prize winning awards. 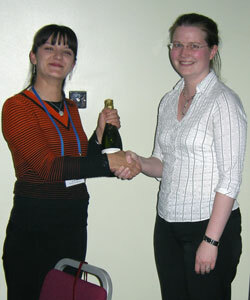 Amber Thompson was awarded the International Union of Crystallography Prize (a copy of International Tables) for her explanation of the advantages of choosing non-standard space groups. Kirsten Christensen was awarded the Durward Cruickshank prize for a young crystallographer who had made an outstanding contribution to crystallography.